Sandwich Dhokla is a famous Gujarati snack.Light and fluffy. It has yellow ‘khaman’ dhokla and white dhokla steamed together.You can serve it with sauce or mint/tamarind chutney. 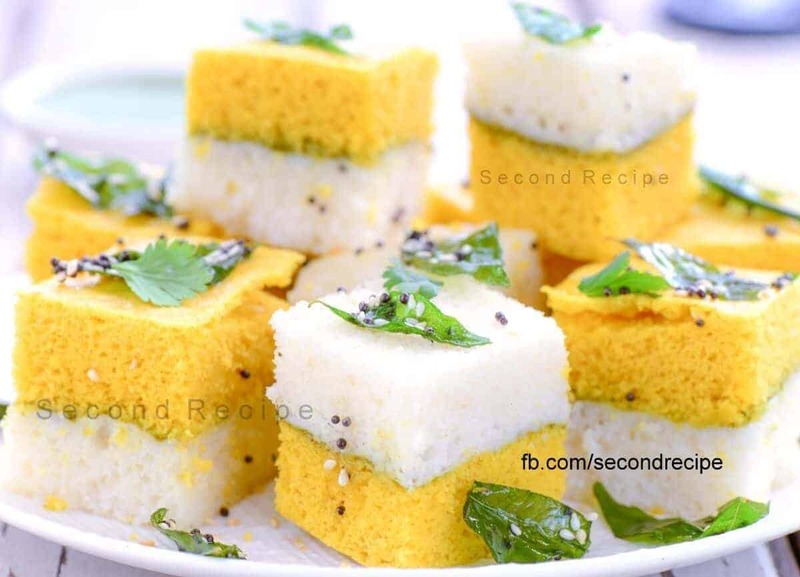 Dhokla is a fulfilling appetizer.It works great for as a starter for a party.It is a low oil, low-carb snack.This works well for those watching their weight.Steaming gives it a soft texture.Thus makes it easy to eat.Most Indians are vegetarian and also avoid eggs.Eating besan/ chickpea flour helps you with protein content. You may choose to make multiple layers, if you do not add chutney in between the layers then they will stick more firmly. Add all ingredients for while dhokla except Eno and let it rest for 5 minutes. Heat the steamer after adding 2 cups of water to it.Grease the container with oil. Add the fruit salt or eno to the batter. Steam for 10 minutes till the rava dhokla is ready. Layer the mint chutney on the Rava dhokla evenly till a thin layer is formed(do not add to much of chutney, else the 2 layers will not stick together. Mix all ingredients for yellow dhokla except Eno.Make a smooth batter. Add Eno and pour the khaman batter on the rava dhokla/chutney. Run a knife on the edges of the pan,turn it upside so that the layered dhokla comes out like a cake. Heat oil , add mustard seeds until they splutter.Add remaining ingredients, cook for 1 minute. Add tempering on the dhokla pieces, serve immediately. If serving at a later point in time, add the tempering at that time. Click here for more appetizer recipes.